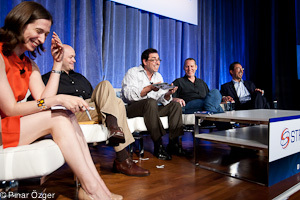 GigaOm has a post on the Structure session with Calxeda, SeaMicro, and Tilera. At GigaOM’s Structure conference, hardware executives from Calxeda, SeaMicro, AMD and Tilera battled it out over how the hardware infrastructure of the future will take shape. For the most part, the debate came down to the need for highly efficient hardware that used up a fraction of the space and a fraction of the power of legacy hardware solutions, versus the desire for more powerful options from existing hardware makers. I started blogging on the idea of the little green server with an Intel Atom 3 years ago. ExtremeTech has an article building an Intel Atom based PC. Intel's Atom has generated a lot of attention. Some of that attention has been positive: Intel building an x86 CPU whose primary design goal is very low power usage while maintaining good performance. On the other hand, Atom has been criticized for given up some key performance features, such as speculative, out-of-order execution. What the author misses in making this an efficiency vs. performance battle is with many software services at large scale the cost of providing the service is the issue. People want performance and efficiency, but want defines success is the cost of the service. The next year will be when we see these servers hitting the market in mass. Whoever is providing the lowest cost for performance per watt is most likely going to be winning the most amount of business. I would watch the guys at Calxeda with ARM processors.